The number of kits issued in Scotland's pioneering programme to cut drug-related deaths (DRD) has risen by 10%, official statistics have revealed. Since 2010 users of heroin and similar drugs can be given naloxone kits to reverse the effects of a potentially fatal opioid overdose. The Scottish government-funded programme was introduced in an attempt to cut the number of drug deaths. There are now calls for a similar scheme to be introduced in England. Naloxone is a prescription-only drug in the UK but in Scotland it is legal for trained carers, hostel managers, drug users, and addicts' friends and family to carry in case of an emergency. The figures, issued by the Scottish government's Information Services Division (ISD), show in the year 2015-16, a total of 8,146 take-home naloxone (THN) kits were issued, a 10% increase on the previous 12 months. There was a 6% rise in the number of kits issued to prisoners about to be released. Figures show that since 2010 there has been a halving of the proportion of offenders dying from opiod-related overdose within four weeks of being freed. Edinburgh Prison issued the highest number of kits in 2015/16 (142, a 19% decrease) followed by HMP Addiewell in West Lothian (114, a 97% increase). Scotland's Chief Inspector of Prisons (HMCIP), David Strang welcomed the continuing use of naloxone among prisoners released from jail. He said too many were dying from drugs overdoses shortly after being freed. "Perhaps their tolerance has been reduced due to their being in prison," he said. "So the naloxone programme which is there to support someone who has overdosed has been successful, and I welcome that reduction. "But there is still more needs to be done to provide addiction support and health care to people when they leave prison." The overall naloxone programme is expanding as Scotland's drug deaths figure has reached record levels. In 2015 there were 706 deaths, compared with 584 in 2011, the year after the introduction of the THN programme. But researchers who campaigned for action on drug-related deaths have praised the Scottish government. Prof Sheila Bird of the Medical Research Council, who advised ministers, said they deserved global credit for a "courageous public health decision". She said: "Ministers backed statistical science and the prioritisation of public health in the need to tackle the age-related rising tide of Scotland's opioid-related deaths." In an editorial in the British Medical Journal (BMJ), the president of the Faculty of Public Health, John Middleton, called for a similar programme in England to arrest the increase of drug-related deaths. He wrote: "Investment in lifesaving interventions like naloxone has been sluggish." Mr Middleton added: "Local authorities must ensure substantial take up of naloxone to opiate users and their family and friends for administration at overdose. "We need to expand the options available to people seeking help and ensure treatment is personalised and effective." In the US, which is in the clutches of a heroin and opioid epidemic, naloxone is reported to have saved 27,000 lives between 1996 and 2014. But its use has sparked a debate, with critics arguing that by reducing the risk of overdose, the problem of addiction is perpetuated rather than eradicated. A Scottish government spokesperson said: "Scotland was the first country in the world to introduce a national naloxone programme, and this scheme helps people who are at risk of opioid overdose. 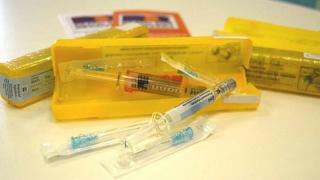 "Naloxone alone is not the solution to drug-related deaths. However it is an important intervention, within a range of available treatment and support, which can help reduce harm and support people towards recovery."